A masterplan to guide the future regeneration of Rotherham town centre is set to focus on seven key sites. 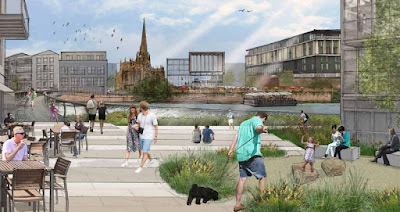 The plan will "set out a coherent set of land use and design parameters" for the sites and will then be used to promote the wider town centre to potential investors and encourage further regeneration and improvement. Previously the Rotherham Forge & Rolling Mills, the 1.57 hectare site is currently home to an empty supermarket and a car park following the relocation of Tesco across town in 2014. It was identified as a suitable site for development of a town centre leisure hub as detailed in the earlier plan which placed bringing a cinema and leisure development to Forge Island as the first "key move." Market analysis has suggested that there is an appetite amongst cinema operators to locate within Rotherham as part of a wider leisure scheme, including family pub/restaurant, gym and hotel (cgi above). The Council included an option to buy the site for £1.5m when Tesco vacated and moved across town to the a £40m store on the site of former council buildings on Drummond Street. It also owns land and property over the river and is in discussions with the Government regarding the future of the site of the Magistrates' Court, since the Ministry of Justice ruled that it would close by the end of the year. Previously Westgate Station, the 1.43 hectare site is currently home to the Royal Mail sorting office, BT's telephone exchange and land used for car parking. The site has a long planning history with owners, Satnam Urban Regeneration, putting forward plans for a food store to rival those being put forward for Tesco. A long running legal battle with the Council came to an end in 2009 and nothing much has happened since apart from the rebirth of pubs as real ale favourites. The Local Plan earmarked it for a mix of uses, predominately housing, but not retail. The site is allocated an indicative number of 143 homes to be delivered between 2021 and 2026. However, Royal Mail currently has no plans to close or relocate the sorting office and asked for a policy that states that "the re-provision / relocation of Royal Mail's operations will be required prior to redevelopment." 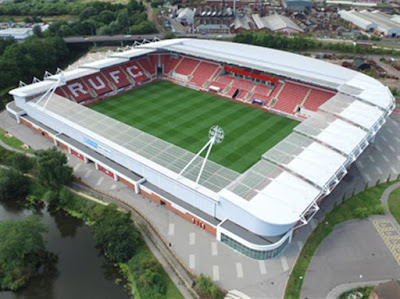 Previously the site of a famous foundry employing thousands of workers, it is now home to Rotherham United's £20m New York Stadium and Rotherham Council's £60m offices. The success of the Millers, on and off the pitch, has not led to further regeneration around the stadium ever since English Heritage strongly objected to plans to demolish the Grade II listed buildings that sit between the two modern buildings. Feasibility work was carried out on a potential 100-bed riverside hotel surrounded by restaurants, bars and shops. Offices and a call centre have also been mooted. Like land at Main Street (see below) it is put forward in the Local Plan for a mix of uses, with the area "considered to be suitable for B1 office and hotel uses given its gateway location and proximity to Rotherham town centre and public transport interchanges. It is also considered suitable for assembly and leisure uses given its location, existing uses and proximity to Rotherham town centre." Most recently used as a nightclub and car parking relating to the Council offices, the 0.8 hectare site is a high profile site fronting the busy Centenary Way. Allocated for a mix of uses (see above) it is currently up for sale, advertised with the potential for retail, leisure and road side uses (subject to the necessary planning consent). The 22,000 sq ft, 2,000 capacity Liquid nightclub was put up for sale by Luminar before its administration in 2012. Under ownership by Ron Hull Jr Ltd, it was demolished last year. A £5m road scheme at New York Junction has completed and was designed to open up land for redevelopment, not least the adjacent Main Street site. The town's bus station also includes a retail development covering 55,000 sq ft, consisting of 18 units and 750 parking spaces. Opened in 1971, the car park has since developed widespread defects and is "nearing the point of being beyond economic repair." 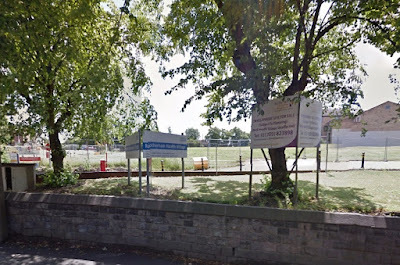 Talks have been ongoing since the operators, the SYPTE, Rotherham Council and owners Norseman Holdings met in 2013 to discuss potential alternative development options for the site. The SYPTE is set to decide on whether they wish to redevelop the site as an Interchange or continue a programme of repairs. Corporation Street has seen a reduced footfall since the relocation of Tesco across town from Forge Island and has been in gradual decline as a retail destination. It is blighted by a number of burn-out buildings. The markets continue to welcome over four million customers per year but the outdoor markets area is underutilised and has significant issues in terms of its access and permeability into the indoor markets area. A redeveloped markets complex was identified in the borough's growth plan. Over the road and adjacent to the new £40m Tesco, Drummond Street Car Park is also earmarked for redevelopment. The council-owned site was controversially cleared, demolishing a former Victorian hospital. Led by the RNN Group, a £12m Higher Education (HE) campus is planned here and proposals to secure funding, and the land from the Council, are well advanced. It could accommodate a 44,000 sq ft campus - enough space to eventually house 1,000 students. The aim is to be open for the 2017/18 academic year. There is significant land still available to locate other complementary developments. Interest in using the site, where any development will not affect the adjacent medical facilities, has also come from providers of specialist housing provision. I hope there will be plenty of open and diverse communication of proposed planes to all people of Rotherham. Is for long term learning, with collaboration from Sheffield Universities. The use of town centres as housing for young families, students, Eldery, keeps the place thriving. I hope these residential developments are high rise living especially riverside,as its a waste of land to build semis in a town centre. I agree with Roy Herbert about the eyesores of the burnt out buildings at the bottom of Corporation St, they have stood unused for a long long time and it's depressing to continually see them in such a shocking state. The Guest & Chrimes buildings also look really bad and need to be demolished urgently to allow that area to be developed to its full potential.I understand that English Heritage want the buildings to remain but it's not they who have to fund their refurbishment.